The Mexican is facing the French flag. The ground is lava. The sky is night. A huge pistol is three feet to the north of the Mexican. 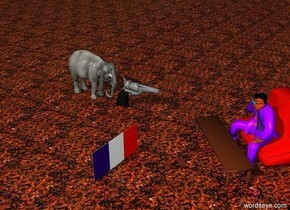 A small elephant is behind the huge pistol. A break from the Zoo. 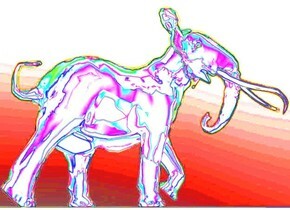 a glass elephant. ground is silver. sky is texture. 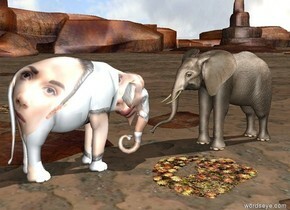 a glass peacock is on the left of the elephant. 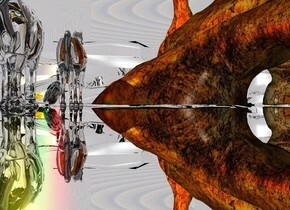 a glass horse is on the left of the peacock. there is a cave. a yellow light is on the glass elephant. a green light is on the glass peacock. a orange light is on the peacock. there is peacock. 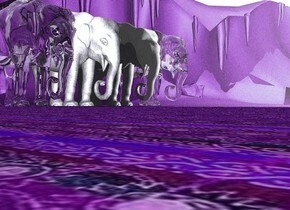 a purple light is behind the elephant. a red light is on the peacock. The ground is fire. The sky is hell. The elephant is in the ground. The child is on the elephant. There is an elephant. the elephant is [texture]. 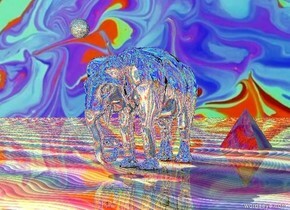 There is an enormous mirror on the right of the elephant. the mirror is clear. the mirror is in the ground. the mirror is 100 feet wide. 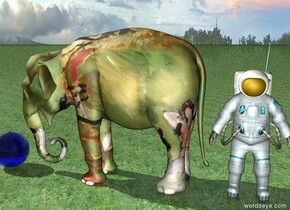 it is facing east.There is a clear elephant next to the elephant. it is afternoon. the ground is [texture]. The elephant saw the giant ball. The ground was grass. The ball was blue. The elephant was Matisse. There was a astronaut. The astronaut was cyan. 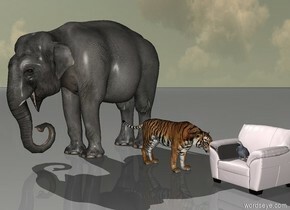 The pink loafers are beneath the elephant. 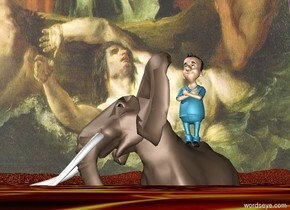 The big baby is on top of the elephant. The jail is to the right of the elephant. The sky is dark. 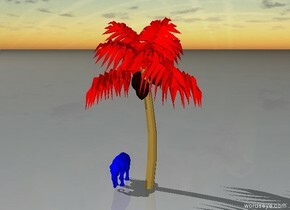 The big tree is in front of the elephant. 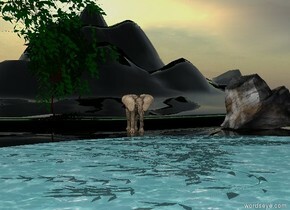 The pond is to the left of the elephant. The stars are in the sky. The big rainbow parrot is on top of the tree. The swan is on top of the pond. it is dawn. the ground is red. There is a white cat. right of the cat is a big brown mouse. The cat is facing to the mouse. Right of the mouse is an elephant. 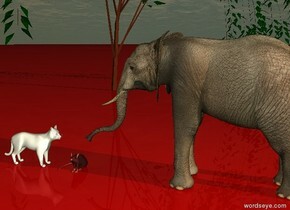 The elephant is facing to the mouse. Behind the mouse is a tree. 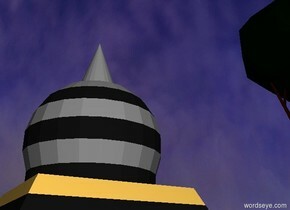 The star is on top of "glints". The sky is cloudy. The ground is grass. 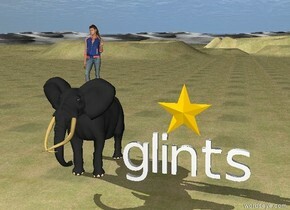 A small elephant is to the left of "glints". A small girl is on top of the elephant. 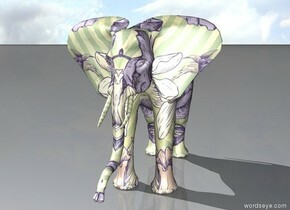 A [persian] elephant. A big bucket is inside the elephant. 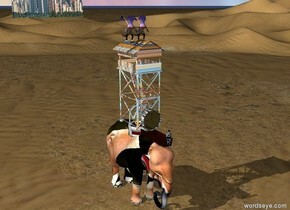 A [gold] tower is above the elephant. The tower is 8 feet tall. 2 [chinese] dragons are above the tower. The dragons are 2 feet tall. A phoenix is above the dragons. A [metal] clock is in front of the tower. A trough is below the clock. A tiny [robot] man is in front of the trough. 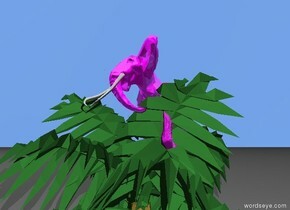 the shiny fuchsia elephant is in the tree.